Before you buy the iPad app, we recommend you to test the connection using the free iPhone version of the app. and help you to make a decision - to buy or not. After you successfully tested the iPhone version on your iPad, you can just delete it. We strongly recommend to read the FAQ page completely before making a purchase. On Mac, the server requires Mac OS X 10.6.8, 10.7.5, 10.8 and higher, on computers with 64-bit processors (you can check your processor using this list). On PC, the server requires Windows XP/Vista/7/8. On Android devices, the server requires Android OS 4.0 or higher. Device should be rooted for mouse emulation support. How to install and run Air Keyboard? Download a PC/Mac/Android-version of Air Keyboard from this website to your computer, install and run it. Windows Installer 3.1. Usually it is included, but if not, you can download it from the official microsoft website. .NET framework 2.0. If you do not have it, please download it using this link and install, or use our installation instruction if you are a Windows 8 user. For Android server, please read the following installation instruction. Run Air Keyboard on your mobile device, choose your computer name in the list, and you are connected! When Air Keyboard is started first time, in the end of the installation process it will show you an automatically generated password. You can change the password at any time, please refer to "How to change my password?" section. To keep your system secured we strongly recommend you to follow the security rules. On Mac, when running the server program after it just installed, the following window can appear. It's becasue we store your password in the Keychain. Please click "Always Allow" button. I do not see my computer in the list. What should I do? Ensure that Air Keyboard PC- or Mac-version is started. If you can find its red icon in your Windows tray or black icon in the Mac status bar, then it is started. We use UDP port for computer discovery and TCP port for data transmission. Ensure that your firewall is properly configured to make possible to connect to port 55535 via TCP and UDP. We strongly recommend to prohibit Air Keyboard server to be available via public network (Internet), but allow it to work only in private network (local). For Windows, follow the detailed Windows Firewall Settings instruction. Ensure that your computer and the mobile device are in the same local network. For computer discovery Apple Bonjour service is also used. On Mac, it is installed by default. On Windows, it is installed when you install iTunes. You can download iTunes from the official website. If automatic discovery does not work, try to add your computer IP address manually. If you still cannot connect, then most likely your WiFi router blocks traffic from Air Keyboard. In this situation, you can try to connect using "Personal Hotspot", so your router is not used. There is another way if you have required skills: you could try to configure your router so it allows TCP/UDP connection on local network on ports 55535 and 55534. If you still cannot connect, and you bought the app (for iPad), then we suggest to get money back via AppStore. I do not have Wi-Fi. Is it possible to control my computer? 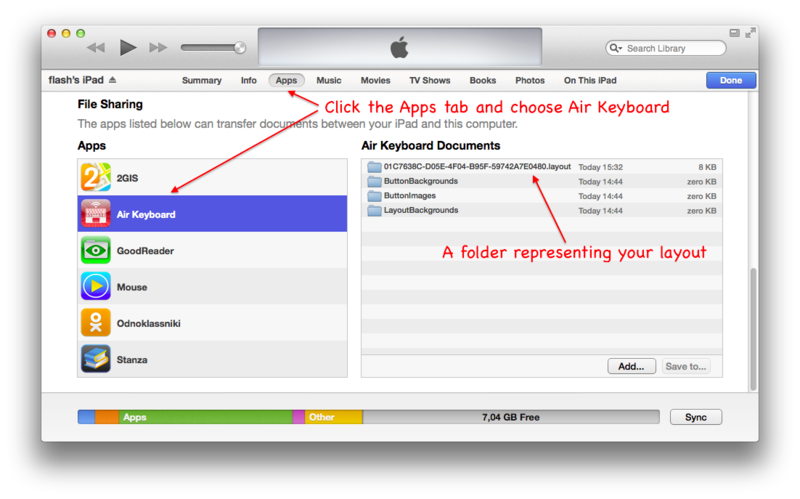 Yes, if you use Air Keyboard on iPhone or iPad with 3G support (SIM card with Internet is required). 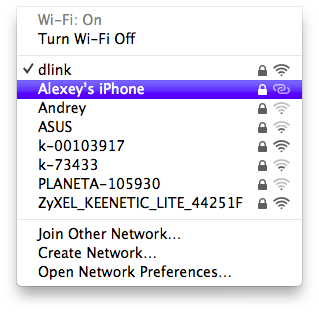 You can do it using "Personal Hotspot" feature, which allows to host Wi-Fi network on your iPhone/iPad, or allows to use Bluetooth connection to your computer. To start "Personal Hotspot", you have to have "Cellular Data" turned on (make sure you'll not loose money when doing it), then open "Personal Hotspot" window and turn it on. 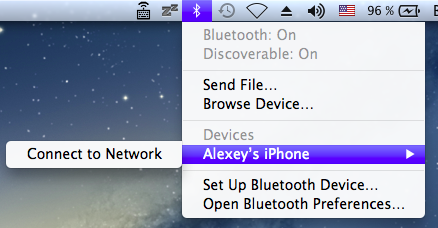 On Mac, connect to the device via Wi-Fi or Bluetooth depending on what you have chosen on the "Personal Hotspot" window. If you bought the iPad version of the app and you do not like it, you can get money back via AppStore. 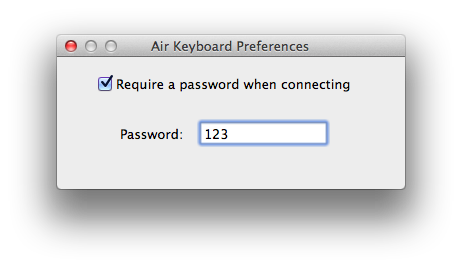 A random password is set when you install and run Air Keyboard at first time. to be executed (giving it administrator permissions), you will not be able to type or move mouse cursor on that window. The reason is a built-in Windows protection against simulation, and for the moment we want to leave it like this for your own safety. Also, if a program was started under administrator account, you will not be able to control it. Please restart the program with the normal account. On Mac, only scroll gesture is supported. Full and Compact modes have only US layout. "iPad" keyboard mode supports any layout installed in iPad, even if it is not set up in your computer. If you need another layout in Full/Compact modes (e.g. AZERTY), you can create it by yourself using Layout Designer. We are planning to add another layouts in future. You can connect your iPhone/iPad to the computer with bluetooth in limited cases. It requires your device to be connected to 3G or EDGE, so make sure you will not loose money when using a data plan. Since server version 1.8 data sent between your mobile app and computer is encrypted. Run the server only when needed. Remove Air Keyboard server from autorun. 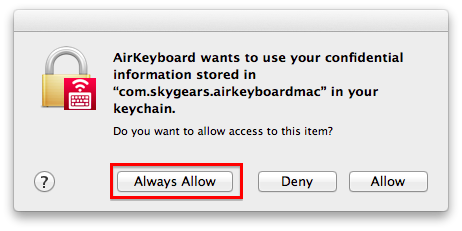 On Mac, open System Preferences, then "Users and Groups", then "Login Items" tab, and remove Air Keyboard from the list. On Windows 8, open Task Manager by pressing Ctrl+Shift+Esc, then open "Startup" tab, find an item with Air Keyboard icon and press "Disable" button. On Windows XP/7/Vista, open Startup folder from Start menu and delete a shortcut to the Air Keyboard program. Do not run the Air Keyboard server program under Administrator account or with elevated permissions. Setup your firewall in such a way that Air Keyboard server allowed to connect with computers only from your local (private) network, not the Internet. For Windows firewall, ensure that Profile is Private in the firewall settings of Air Keyboard. Make sure your password is strong enough. 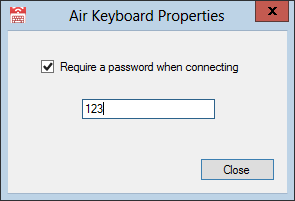 We do not recommend to use Air Keyboard to enter sensitive data, such as logins, passwords, credit card data, etc. For any questions or in case of troubles please write to support@skygears.com. How to delete custom layout? Open the layout designer, on the list of custom layouts swipe from right to left and "Delete" button will appear. The layouts you created are stored at Documents folder of the app. You can access this folder using iTunes application. In iTunes you have to choose your iPad, then click "Apps" tab and choose Air Keyboard app in the list of apps. At the right list you will see the Documents folder of the app. All the layouts you create with the Layout Designer are stored here. Any layout is stored as a folder with ".layout" extension. Name of the folder currently does not correspond to its name in the app and representing an unique number (GUID). You can export any layout to your computer in order to archieve it, change it in a text editor or share it with other people. In order to do this, select the layout folder and drag'n'drop it to a folder on your computer or press "Save to..." button and choose a destination folder. iTunes does not allow you to upload folders. In order to upload layout (which is a folder) you have to pack it into a zip-file on your computer. To create a zip-file on Mac, select a folder in Finder, click with the right mouse button on it and choose "Compress "...""; on Windows, select a folder in Explorer, click with the right mouse button, point to "Send to..." and choose "Compressed (zipped) Folder". When you get the zip-file, just drag'n'drop it into the Air Keyboard Documents list in iTunes, or click "Add..." button and choose your zip-file. Restart the Air Keyboard application on iPad (first close the running app by double clicking Home button, making long-tap on a running app and tapping the close button on the Air Keyboard app). Your imported layout should appear in the application. You can share a layout you created with other user. In the Layout Designer tap "Publish" button and follow the instructions. To get published layouts, open Layout Designer and when adding new layout using "+" button, choose "Download from library"." You can also import and export images using iTunes app. or press "Save to..." button and choose a destination. Since iTunes does not support importing of folders, in order to import images you have to pack them to a zip-file first. (i.e. make "ButtonImages" folder locally in order to place images in "ButtonImages" folder on Air Keyboard Documents). on Windows, select a folder in Explorer, click with the right mouse button, point to "Send to..." and choose "Compressed (zipped) Folder". Make sure that zip-file has a name correspondent to the group ("ButtonImages.zip" for button foreground images). Add this zip-file to Air Keyboard Documents list by dragging'n'dropping it, or click "Add.." button and choose the zip-file. Take into account that the existing images will be replaced. Restart the Air Keyboard app on iPad (please read how-to-do below) and the imported images should appear in the appropriate lists of the Layout Designer. There are two other ways of importing images into the Air Keyboard: from Web and from Photo Library. You can do it by tapping "+" button in appropriate lists inside the app.